An astrophysicist who works for the ESF, Meena Carmine helps to solve the mysteries and investigate the ELS. 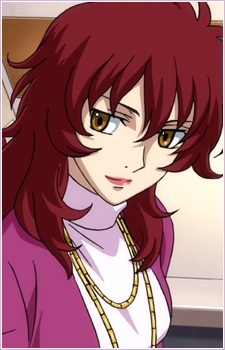 It is also hinted that she has a relationship with Billy Katagiri. At one point in time, an ancestor of Meena donated a DNA sample to the Corner family. This DNA sample was later on used by Alejandro to create the Trinity Siblings. While the Trinity siblings are a result of a combination of this DNA sample and genetic material from Ribbons, Meena herself is a natural born human. Having proven herself to be highly intelligent, Meena's similar appearance, as well as her impulsive and playful personality, to Nena Trinity are coincidental developments. While she does indeed show a jealous streak, it is never shown if she is capable of such callous acts that the Gundam Meister was.